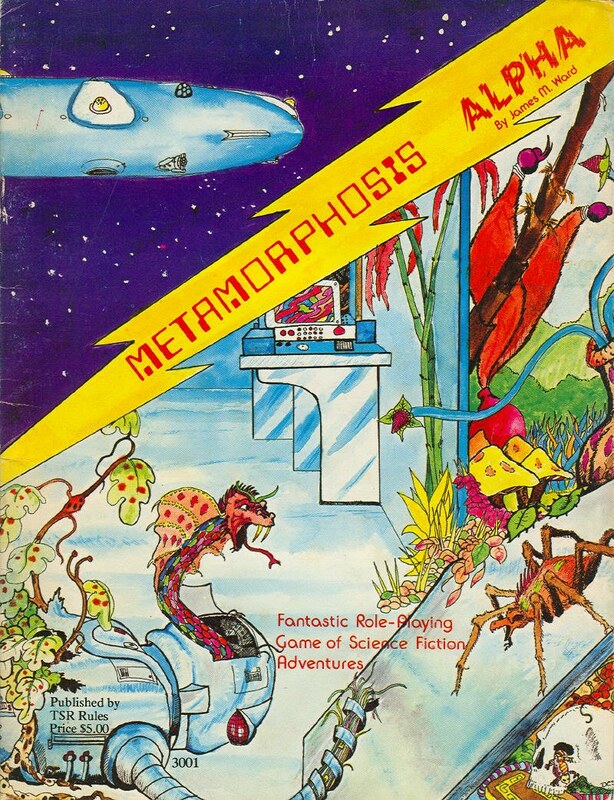 Although Gamma World was (I think) the first RPG I played after Dungeons & Dragons, it was with its predecessor game, Metamorphosis Alpha, that I was obsessed for much of the early 1980s. Written by James Ward and first published in 1976, making it, depending on one's definitions, the first science fiction roleplaying game ever published, Metamorphosis Alpha is set aboard a vast generation ship (called the Warden in a typical example of early hobby self-referential hubris/humor). En route to another solar system far from Earth, the Warden passes through a radiation cloud that damages its systems, kills its crew, and mutates most of its surviving passengers, as well as the Terran flora and fauna traveling with them, into monstrous forms. Over several generations, the descendants of the original passengers forget they're aboard a starship (which still functions, more or less, under the control of automated systems) and new societies arise on its various decks, which are kilometers-long in size and include many areas designed to mimic terrestrial environments for the benefit of the passengers who were supposed to live and work aboard the Warden while traveling for decades to another world. Player characters assume the role of un-mutated humans, humanoid mutants, and mutant animals, as they explore the Warden, ignorant that it's actually a starship. It's a very compelling premise, one that it shares with Robert Heinlein's Orphans of the Sky and Brian Aldiss's Non-Stop (sometimes titled Starship in certain editions). In many ways, it's a much more interesting, if somewhat more limited, premise than that of Gamma World. My own obsession with the game stemmed from the fact, sometimes after I acquired Gamma World, I also the first Best of Dragon compilation, which included articles about Metamorphosis Alpha in it. These articles were strangely inspirational to me, all the moreso because they were for a game that I'd never heard of, let alone seen, but that clearly bore a lot of resemblance in basic premise and rules to my beloved Gamma World. Thus began my quest to find a copy of the game, a quest that ended in vain. I asked the guys down at my favorite game store about Metamorphosis Alpha, but they told me it was long out of print and my best bet was to go to a convention and win it at an auction. The old grognards who hung out there added that MA "wasn't very good anyway" and that I was better off just using Gamma World and making up the rest. And so I did. I pulled out my huge graph paper sheets and set to work to mapping out my version of the starship Warden. It was a long and tedious undertaking, filled with lots of missteps and heartache, because I never felt I could get it "right." This vessel was supposed to be 80 kilometers long or so, which meant that even a big map would have to use a very large scale. Moreover, what would a vast generation ship even look like? The only starships I'd ever seen were from movies and TV shows and none of them were generation ships designed to house a huge number of colonists, animals, plants, and machinery for decades of travel across many light years. Eventually, all these worries and concerns got the better of me and I abandoned my maps, something I regret now, even as I fully understand why my younger self admitted defeat. Over the years, I retained a high degree of interest in Metamorphosis Alpha and kept hoping that, one day, a new edition would be released that'd give me everything I'd hoped for back in the days before I could even take a look at this mythical game. As it turns out, new editions have been published over the years, but each one has been a terrible disappointment to me, utterly lacking in the aura of mystery and possibility that surrounded the original. To be fair, some of that isn't the fault of the new editions -- though some of it is, as nearly all the new editions have been conceptually flawed in significant ways -- as much of the mystique about this game for me is that I could never find a copy. You can still get the PDF, from RPGNow; it even includes the errata from James Ward himself. Only $5.95. Seems Mr. Ward was pretty smart -- he kept the copyright, so even though TSR/WOTC/Hasbro owns the rest of the TSR products, he still owns Metamorphosis Alpha. Which works out good for us. It's too bad you hadn't seen Starlost http://en.wikipedia.org/wiki/The_Starlost>Starlost, a Canadian science fiction T.V. series that aired in 1973. It was about the descendants of the crew and colonists of a colony ship that didn't realize they were on a colony ship. You probably would have had a much easier time envisioning your version of Warden after seeing the show's 13,000 km diameter ship of self-contained biospheres. This show may have been the inspiration for MA, though it wasn't aired widely in the U.S. I remember that "Best of Dragon". It was the first Dragon Magazine I ever picked up. Living where I did in South Dakota, I never had much contact with other gamers. That magazine (and its well remembered Metamorphosis Alpha article), really opened my eyes that there was a larger gaming world out there, and not all of it was D&D. Its just a weird bit of nostalgia for me. In fact, I still have that much-abused copy of Dragon Magazine, takes me back every time I read it. I actually asked Jim Ward about Starlost once, and he said he had never heard of it. Funny, it was the natural model as far as I was concerned, and I always intended to remake the Warden with exactly those sorts of self-enclosed domes for the design. There's also a fantastic series by Gene Wolfe about a similar Generation Ship whose passengers have forgotten they're aboard a vessel; it's called the Book of the Long Sun and well worth checking out! Yeah, the Starlost connection gets overplayed on the Net, particularly among Canadian gamers. That's not to deny that the series is good inspiration for an MA game, but I've seen no evidence that Jim Ward was influenced by it (or even knew of its existence). And, yes, it's great the PDFs of the original book are available. It's better than nothing, but I'd still love to own a hardcopy. It's one of my few remaining gaming lust items. Well then I wish you the best of luck. Those are getting rarer and rarer. If I find one I'll let you know, though. They come up on eBay fairly regularly, in the $30 - $50 range. I got one for $38 about a year ago, and another for $25 more recently. Starlost played on the local UHF channel in Sacramento when I was young, but it was often preempted, so I only saw a few episodes. I remember thinking at the time it was pretty bad, but this post has roused my curiosity, so I've added to my Netflix queue. And I'm surprised Ward never saw it; I'd always assumed MA was influenced by it and "Orphans of the Sky." Security word: "bionsug," a bio-machine security 'bot on the Starship Warden. Speaking of Gamma World, as an interesting note I spotted what is claimed to be the original Keith Parkinson cover painting (2nd ed I think, the one with the cyborg bearcat mount) is up for sale. Just search Gamma World on the 'bay and it will come right up ($6000 price tag too). To my knowledge he was not familiar with The Starlost or Orphans of the Sky when he did MA, but they do make grate sources of inspiration. By the way, I got a Wiki for Mutant Future, I made for fans to throw out their rules and ideas about the game. The best place to start on that page is Gaming Philosophy. The site is a major work in progress, but you might find something useful over there. Even though I still have my copy of MA, I have recently used Mutant Future set on the Warden. After three games the players still don't seem to be aware they are on a starship. I'm pretty proud of that. I'm pretty sure Orphans of the Sky was mentioned somewhere in the rulebook, so Jim must have been aware of it. I read it around 1978 not long after I got MA, and it is a must read for anyone GM'ing the game. I just reread the whole rulebook in preparation for this entry and there are no mentions of any source material in its 32 pages. If Ward mentions his inspirations for MA anywhere, it's not in the rulebook. He does mention some inspiration in the first edition Gamma World rulebook, but Heinlein's story isn't one of them. Instead, he states that Brian Aldiss, Andre Nortion, Sterling Lanier, and Ralph Bakshi's Wizards were his main influences. I found MA in a used-games bin in a game shop many years ago. Never played it, but it immediately reminded me of my first edition Gamma World boxed set... and when I got it home, I noticed both had the same author. You can see where Ward drew pretty heavily on MA when he did GW. I have read MA. I have seen Starlost. Aside from both of them taking place on a big starship, they are about as similar as "Star Trek" and "Lexx," that is to say, "not in the least bit." While I certainly bear Jim Ward no ill will -- he's certainly a more successful writer than I am, and I have very much enjoyed Ward's work -- I have often wondered what kept Robert Heinlein from suing the pants off him. Great post, I saw that same Best of Dragon article back in the day too & wondered about the game. Never got a chance to read it until the pdf was available. While I heartily agree with you about the brilliance of the "Long Sun" series by Gene Wolfe (he is my favorite author, period) I don't think it bears too much in common with the pulpy joys of MA. Wolfe is just too literary. Anthony, your childhood memories are not far off; Starlost is awful, so I hope you're not too disappointed by it! Here's an interesting development that may be of interest to people interested in The Starlost, running a generation ship game, or both. According to the Wikipedia entry, the pilot episode was originally titled "Phoenix without ashes" (See: http://is.gd/djbRX ). But the author, Harlan Ellison, grew upset (Ellison? Upset? Unheard of.) with budget cuts and the dumbing down of the series and eventually left. Ellison published "Phoenix without ashes" as a novel in 1975. Fast forward to today. Out of curiosity, I looked on Amazon to see if Phoenix was still available and found this: http://is.gd/djc9O . "Phoenix" is coming out as a graphic novel in December. The price is a bit much, if the details at Amazon are right and it's only 21 pages long, but the original teleplay (which differed from what was produced) was an award-winner, so I thought someone here might be interested. It's pretty amazing by modern standards that you could squeeze any sort of reasonable game and background into 32 pages. "The Starlost" revolved around a guy from an Amish community who discovers to his shock that his whole world is just one bubble hanging on an enormous spaceship. He leaves the bubble, meets other people from other cultures, and they team up to get to the Control Room to keep the ship from crashing into a star. The flavor is multicultural, and seventies, with environmental and character driven themes. Or at least it tried to be. It has been called wretched, here, and I will not argue. "Metamorphosis Alpha," on the other hand, features mutant and nonmutant player characters aboard a malfunctioning starship who may or may not be aware it's a starship at the beginning of the campaign, and who have adventures wandering around the ship and through the other environment modules. The flavor is much more "tribesmen with antlers wielding spears and ray guns." I'm curious about your comment that each edition after MA1e is a "terrible disappointment". I have a copy of every version of MA (admittedly just a pdf of the 1e) and I have a different pov. MA1e is an interesting game and deserves mention as being the first science-fiction RPG. However, it has a very bleak premise in that no matter what the PCs do, they are ultimately doomed. I regard MA2e (Metamorphosis Alpha to Omega) as being superior to MA1e. While the game uses the old Amazing Engine system, it provides more information about the ship and gives PCs hope and something to pursue. It also has a very good map for the Warden. MA3e is probably the worst of the bunch. It is basically a military slugfest against aliens invading the Warden. The 3d6 system used in that incarnation is lacking and it just didn't grab me at all. Still, I stuck around for MA4e. This version is beautiful. Alright, it is still limited to the "fight the aliens" mindset of MA3e, but there is more than enough sandbox information in the game that lets you use it as a core set of rules for any science fiction adventuring in the MA setting. Indeed, I used MA4e as the background to a GW6e game which involved having the PCs' personalities beamed to a generation ship as troubleshooters in genetically engineered bodies. MA4e also ties in very nicely to the expanded history for the original GW. I have heard of MA5e. I await this with some trepidation as it will use D&D4e as its core system. Still, I am trying to overcome my prejudices and may buy it even if it is just to keep the continuity in the collection. Sometime it would be interesting to read your views on MA. Yes, Starlost would be an inspiration but so could RAMA (Clarke's novel)...the ideal of a Spaceship encompassing a biosphere was a popular idea of the 1970s since Skylab entered the popular imagination. But, I would even trace it back to Simak's Cities in Flight. I always liked the premise of MA but could never like the backstory. A few years later, I would see a wonderful Call of Cthulhu takeoff of MA and have used that as the Gold Standard...in which players (and many of the NPCs) have had their brains removed by the MiGo and implanted into different forms of life including robotic forms on their Generation Ship causing some to explore their new identity, go mad from the experience or just remain dormant till activated. What I am trying to say related to my earlier post is that MA just feed off the many tropes/memes that were so-common in the 1970s as the environmental movement was waking people up to the notion of Starship Earth - otherwise this planet is sailing through the cosmos only has a thin skin that we are tampering with and may cause us to be exposed to the "Monsters that are out there". Mutants and whatnot were the extension of the degrated human form much as a Wells' morlocks were who could feed off the Eloi. I love The Starlost (bought the whole series recently) but it and MA have practically nothing to do with each other. The warden being a sort of super-massive multi-deck barge, and The Starlost resembling a much larger play on the ship from Silent Running. They can inspire each other a bit, although The Starlost was more about human interaction and not so much about evolution and mutation. I'm curious about your comment that each edition after MA1e is a "terrible disappointment". Well, of the sequels, I only own the Amazing Engine one anymore and find it far less interesting than the original (though the maps are nice). The two Jim Ward-penned ones were awful, both in terms of system and the way they added this whole "alien menace" element that I think weakened the whole premise of the game. I have little expectation that the new 4e-based one will be much better. The original MA was one of the first RPG that I bought and I did like the premise and the rules seemed fine to anyone used to White Box D&D. I think that I ended up avoiding the later editions because of the much stronger metaplot where the first edition left things pretty loose for the GM to decide on how they wanted things to go. I ended up reading Non Stop and Orphans of the Sky because of getting MA so it got me to read some decent SF too. Another thing I found semi inspirational for the setting was Philip Jose Farmer's Riverworld as that had an artificial universe that could give ideas for different decks in the Warden. I read about MA back in the day, never found a copy until a few years back. I love it, as I do the earliest GW rules. Would love to see a starship design. FWIW, I have Phoenix Without Ashes, and altho I'm an Ellison fan, I didn't enjoy it too much. And BTW, James Blish wrote Cities in Flight, not Clifford Simak. I snagged a copy at the CoastCon Sunday auction that goes to charity. I think it was around 1989 or so, and the benefit was for AIDs. Not many people were bidding for it because they might not have known what the history of the game was. My winning bid, if I recall correctly, was only something like $14.